Whatever the space, whatever the design, we can use our skills and knowledge to develop a solution right for you. 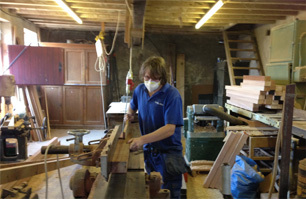 Having served an apprenticeship at Don Joinery in Hillsborough in the 70’s, Alan Bestall has worked on various different sites in South Yorkshire and learnt many valuable techniques incorporating many different types of carpentry and joinery work. He made the decision to become self-employed in the early 90’s and has since acquired a wide range of machinery and a workshop in the S6 area of Sheffield. He has built a solid returning customer base, ranging from hanging doors to complete building renovations as detailed in our products list. Get in touch with us by filling out our online form!